For the past week or so, I’ve been trying to learn Swift, which is a programming language used to make iPhone apps. I’m working my way through a free intro course on Udacity, which has been very helpful and a good reminder of how much great stuff there is on the internet. The course explains things clearly, which is nice, but the best part of the course is that it teaches how to learn more by yourself. This ability to use Swift’s documentation and Google searching to answer questions is easily the most valuable skill taught by the course. All of the knowledge necessary to become a master programmer seems to be freely available on the internet, if you know how to find and comprehend it. That’s probably true for a lot of things besides computer programming. It is certainly true for significant parts of my job analyzing federal budget policy. The Congressional Budget Office, a nonpartisan agency within the Legislative Branch, publishes budget and economic outlooks that are an excellent and freely available introduction to the federal budget. The Center on Budget and Policy Priorities, a progressive think tank, publishes an excellent series of “Policy Basics” on key issues. If I need to answer a budget question I don’t already know, my first step is often to Google it. The ability to answer questions with a Google search is so powerful that someone made an entire website devoted to mocking people who don’t understand it, called LetMeGoogleThatForYou.com. If someone asks you a question that could easily be Googled, you can use that website to create a custom link to Google that for them. Here’s an example. There was even a Senate bill called the “Let Me Google That For You Act,” which I learned while making that example. Of course, there is more to learning than Google searching. I’d argue the most important part of learning is interacting with other people. Those conversations challenge assumptions, identify gaps in knowledge, offer new perspectives, and share information learned over a lifetime. As much as I value Google and the Congressional Budget Office in my work, the strongest foundation for my understanding of budget policy comes from the people I worked with during my previous job at the U.S. Senate and my current job at the Center for American Progress. The benefits of social interaction are always going to be an advantage that traditional schools have over online education (also better sports programs—On Wisconsin!). But the better online learning tools seem to recognize this, and do their best to create as much interaction with real people as possible. The Udacity course I’m taking frequently points users to their message board, where people taking the same course can share their progress and ask questions. This blog post is actually part of my Udacity course, which included an assignment to write a blog about an idea I’ve learned in the course. So I wrote about learning how to find solutions using online resources, and I’d be interested to hear your feedback! This entry was posted in Education and tagged computer programming, online learning, Swift, Udacity on March 3, 2015 by Harry Stein. If you’re looking for a good book on European history (and who isn’t? ), I have four to recommend. They also happen to fit together very well, and I found my understanding of each enhanced by reading the others. 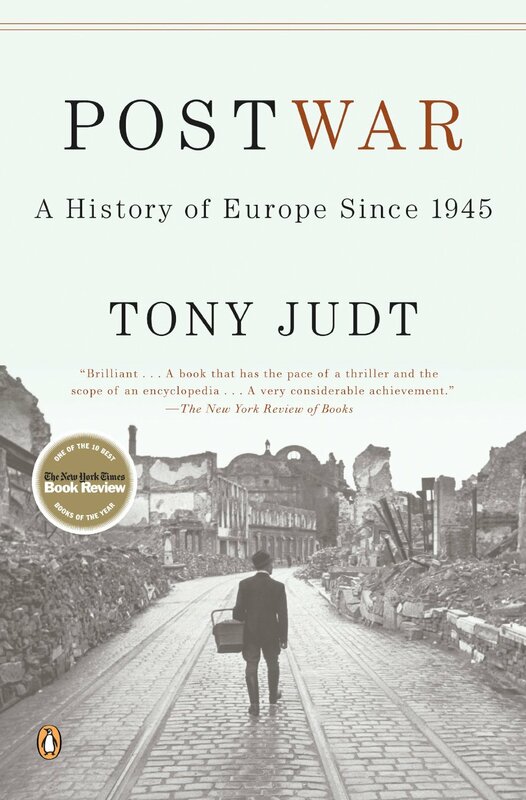 Postwar, by Tony Judt, tells the story of how Eastern Europe and Western Europe went their separate ways after World War II, and how they are starting to come back together after the fall of the USSR. Judt argues that the Iron Curtain was a historical anomaly; from 1945-1989 Europe was split by a disastrous experiment with Communism. This did not just affect Eastern Europe–the course of Western European history was also fundamentally altered by the threat of the USSR and the lost connections with Europe’s eastern half. The book is full of important historic episodes of which I was completely unaware, and Judt’s writing style is compelling and often quite funny (especially the footnotes). But read the book with Wikipedia handy, since Judt often makes references to people and events he seems to assume his reader will understand, but which I frequently needed to look up. Anne Applebaum’s Iron Curtain fills in details on how Eastern Europe came to be dominated by Communist dictators loyal to, and essentially agents of, the Soviet Union. While it may seem obvious in hindsight that Eastern Europe would be dominated by the USSR, that was not a foregone conclusion at the time, least of all to the people living there. Many of these people tried to chart a better course for their countries, but the Soviet Union crushed those voices and installed Communist leaders who were generally brought to those countries by the Red Army at the end of World War II. It’s a good companion to Postwar, which generally has more of a Western European perspective even when discussing Eastern Europe. The prologue for both those books is Bloodlands, by Timothy Snyder, which tells the terrible story of the countries in Eastern Europe that were caught between Hitler’s Germany and Stalin’s USSR. Tens of millions of people were murdered as a policy choice of both regimes during the period from the end of World War I through World War II. These policy choices included, but were not limited to, the Ukrainian famine, the Katyn massacre, and the Holocaust. One of the themes in Postwar is the turn away from extremist ideologies in Western Europe, and eventually Eastern Europe. Bloodlands shows just how terrible those radical movements were. Finally, Thomas Piketty’s famous Capital in the 21st Century is at its core an economic history of modern Europe from the 1800s to the present. Just as Judt argues that 1945-1989 was a historical anomaly for political reasons, Piketty argues that the “Thirty Glorious Years” after World War II were an economic anomaly. Two world wars and the Great Depression destroyed wealth holdings, while labor was in high demand and short supply. Piketty’s argument is that as capitalist economies return to a more normal state, inequality will grow steadily worse as wealthy people are able to invest and grow their savings at a faster rate than the overall economy grows (r > g). This raises the question of whether the moderate European consensus will survive if inequality grows steadily worse in the 21st Century, or whether extremist movements will be able to take advantage of economic discontent. This entry was posted in History and tagged Anne Applebaum, Bloodlands, Capital in the 21st Century, Communism, Europe, Hitler, Iron Curtain, Postwar, Soviet Union, Stalin, Thomas Piketty, Timothy Snyder, Tony Judt on January 11, 2015 by Harry Stein. Dan Snyder sued the Washington City Paper for the story that accompanied this image, which his lawsuit called anti-semitic. Dan Snyder is the worst person in the world. If the National Football League was any other business, its customers would have abandoned it by now. Their obfuscation and denial of the dangers of head injuries comes right out of the playbook of the tobacco companies. They have a long history of hiring scabs. They care more about their #brand than domestic violence. But the NFL is not like any other business; football is really fun to watch. So here’s my proposal: keep watching football, but don’t give any of your money to the NFL. Don’t go to games. The viewing experience is better on TV, and you don’t have to pay $10 for a hot dog. Don’t buy new jerseys. They’re overpriced, and your favorite player probably won’t be on the team for long, so you’ll barely get a chance to wear it. If you feel the need to buy merchandise, make sure it’s not officially licensed by the NFL, so you can be confident it’s a knock-off. I’ve been doing this for a while as a Washington fan – Dan Snyder is a uniquely loathsome person – and it’s not hard. FedEx Field is a terrible place, and I don’t know why anyone would choose to go there. I can get just as angry at our terrible football team by watching the games on TV with my friends. Let’s be honest, we’re not going to stop watching football. I’m planning to watch today, and after I write this I’m going to set my two fantasy lineups. The NFL will still get TV revenue, but they’ll worry if merchandise sales and attendance start to slip. As long as fans keep buying what the NFL is selling, they will keep selling it with only token changes. No football fan can possibly like what they see from the NFL, and the NFL is not going to change until fans demand it. This entry was posted in Football and tagged Dan Snyder, Football fans of the world unite!, NFL, Roger Goodell on September 21, 2014 by Harry Stein.